As technology develops within the military environment, often there will be a transition into the civilian business world with similar technologies but completely different with a wide range of uses. Depending on the market for such technologies, the business community can drive innovation, and create better products that also have military applications. Whether it is the "Tactical to Practical" or the "Practical to Tactical" driving the growth of unmanned aerial vehicles or systems (UAV/UAS), the word "drone" is now commonplace in the military and public life as well. Utility Companies saving risk by the inspection of high tension electrical towers with UAVs. Some National Park Service Units are currently utilizing drones for resource management and fire management missions. The delivery of critical supplies like medicine or communications tools to remote areas. Relay radio and wireless internet hotspots to restore service after a natural disaster. The use of a thermal imaging camera to find a lost person in remote areas (search and rescue). Drones, UAV, or UAS are simply another use of flying robots. Wherever someone currently uses manned aircraft, a drone could possibly be less costly alternatives as in delivering packages to customers, flying over real estate property, of surveying a construction site. Many videographers are finding that in order to stay competitive in the business market, they must be able to produce in-flight videos for businesses, parties, weddings, and other consumer events and business ventures. There are many different payloads that include high resolution, thermal and infrared cameras, like a multi-spectral infrared which is useful for crop inspection. As the technology develops, so with the uses for these highly versatile machines. There are basically two types of different UAVs — fixed wing or rotary wing (planes and helicopters). Rotary can be quad (4), hex (6), or octocopter (8). Fixed wing UAVs are characterized by size, altitude, and endurance and look more like your typical airplane. There are a few internet based companies considering the use of an Ultra High Altitude drone to bring the internet to remote areas. The Federal Aviation Administration (FAA) Aeronautical Knowledge test is a way to get a license for business or larger scale hobby flying and costs $150 to take. These tests are given at FAA-approved knowledge testing centers — typically on or near local airports. The test consists of 60 or more multiple choice questions and requires significant study on current FAA regulations, weather issues, being able to read sectional charts, and other ground and aviation knowledge. To get a small UAS (Unmanned Aircraft System) Pilot license you need to be at least 16 years old. The license is only needed to use if flying for commercial purposes. To fly a drone as a hobby, assuming the drone weighs between .55 lbs and 55 lbs, you need to be 13 years old and have it registered with the FAA. Anything drone that weighs less than .55 lbs is considered a toy. Anytime a drone can be used to protect the lives of the military men and women; they will be armed with live video remote communications to ground troops, essential gear, or weapons. The main drone use overseas in war zones is reconnaissance of unknown areas/buildings, enemy tracking, and force protection (making sure our troops are safe and no one is approaching them). Drones are a great tool to assist in searches for lost or injured soldiers as well as a real-time view of various missions and situations, allowing for commanders to make better decisions in resource allocations. Military: These machines will continue to get smaller, lighter, quieter, have stronger batteries, fuel, or flight times, with better optics and capabilities. Any place the military can avoid the risk of harming human resources, a drone may have a future in the military that continues to evolve. Government: These systems will be become more common and be used for safety, research, and a multitude of tailored uses for federal agencies from the Department of Interior, National Park Service, Intelligence Communities, Local Law Enforcement, Fire Departments and more. Regardless of the entity that uses UAVs, the incredible transfer of risk they offer cannot be ignored. Side Note: The word "drone" was only used to describe these systems (either multi-rotor or fixed wing) over the past few years. More recently, they have always been known as UAV's or UAS's. 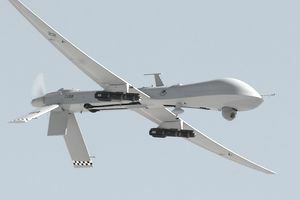 The word "drone" used to be reserved for large systems like the Predator MQ-1.